It's a shark! No wait, it's a dog! It's Shark Dog! 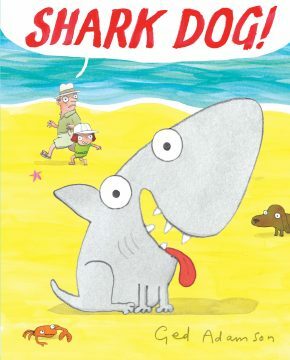 From author-illustrator Ged Adamson comes the funny and sweet story of Shark Dog: half shark, half dog, and a one-of-a-kind pet. Shark Dog is no ordinary pet. Sometimes when he does dog things, he’s more like a shark. And sometimes when he does shark things, he’s more like a dog. But when Shark Dog gets homesick, he starts thinking maybe he belongs with the other shark dogs. Will he go back to Shark Dog Island or decided to stay in his new home? With quirky and colorful art, Shark Dog! 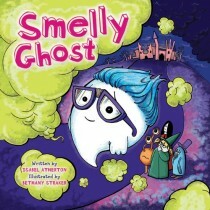 is perfect for fans of such funny books as Hello, My Name Is Octicorn and The Adventures of Beekle. There’s a new species of pet that may excite both fans of shark lore and pet escapades. 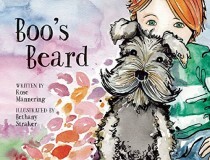 A young girl and her explorer father, each redheaded and white, are on their boat near a tropical island when she discovers that a pet has adopted her. It is of a unique species: the titular shark dog. Its face, coloring, and fin are those of a shark, while its size, feet, and tail are those of a dog. Shark Dog is a difficult pet to handle when out for the usual pet activities. It uproots a tree instead of fetching a stick. It stalks a cat while moving through the grass with just its fin showing. It causes great consternation at the beach. Still, this is a happy pet tale. But then the question of removing species from their home waters raises its head. Shark Dog wants to go home, and its new family quite properly takes it back to its home territory. But this is not the end of the adventure, happily for all. Adamson’s quiet little story combines two very popular animals, sharks and dogs, in a mildly entertaining tale of a family headed by a single dad. The pencil-and-watercolor illustrations are colorful and give Shark Dog an endearing and smiling googly-eyed face.